St. George’s feast day is April 23rd. It’s a simple holy day on our liturgical calendar. Please put April 23rd aside for attending Divine Liturgy to celebrate the feast. St. George, the glorious Great Martyr and wonderworker, refused to sacrifice to the pagan gods, was tortured and beheaded at Nicomedia in Asia Minor. He was martyred in the reign of Diocletian, about A.D. 296. 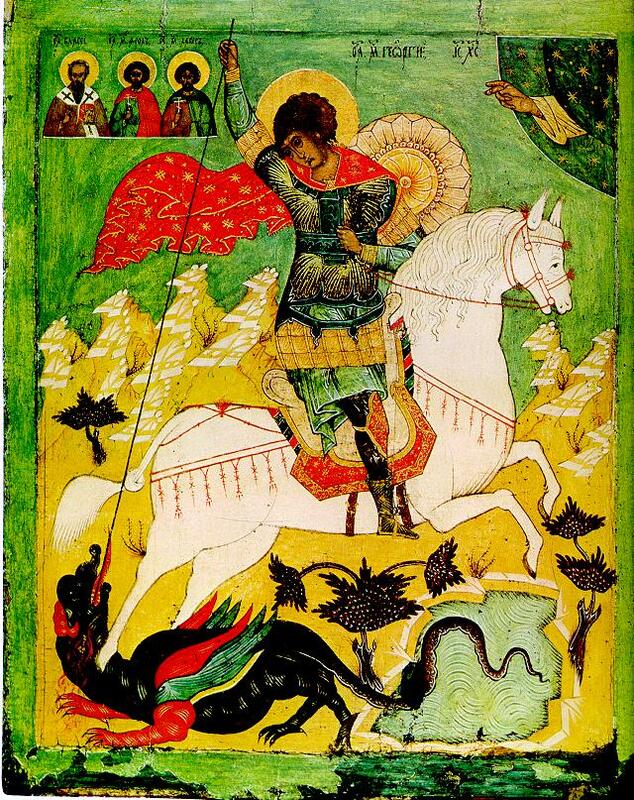 In our iconography St. George is commonly depicted as a soldier riding a horse and slaying a dragon. Joe Kupec, Al Zetsel & grandsons, Bradley & Alex delivered sand, reattached gutter & down spouts, repaired the wooden fence, moved fill dirt into window wells on the old school building and mowed the majority of the grass this week. Please check the bulletin board in St. Mary’s Hall to see the remaining projects. Be part of the team making the list dwindle. It’s another way you can joyously use your God-given talents back to our parish for the glory of God. The Knights of Columbus are hosting Sunday brunch next Sunday, April 18th, following the 10 AM Divine Liturgy, the Knights will be serving: pirohy, kielbasa, sauerkraut, eggs, hash browns, pancakes, OJ, milk, coffee and dessert. A free will offering is encouraged by not mandatory. Come help the Knights of Columbus through your attendance in this community outreach project. Please invite your friends and your neighbors. Christ is Risen!